Most adaptations of classic works of literature make an implicit assertion: that the text being restaged continues to have some relevance for contemporary life. Plenty of these adaptations fail to follow through on that promise, but few dare to challenge it. Why would they? If, say, The Great Gatsby didn’t have something to tell us about today’s America, then why would anyone want to adapt it at all? 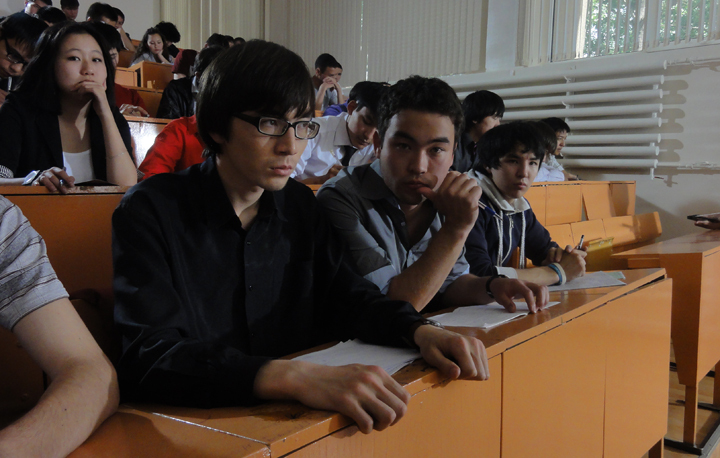 Student, the latest film from Darezhan Omirbayev, questions this basic assumption. Omirbayev’s film, set in modern-day Kazakhstan, faithfully follows the letter of Fyodor Dostoyevsky’s Crime and Punishment while remaining ambivalent about its spirit. Nearly everything that happens in Student corresponds with an incident in Dostoyevsky’s novel, but the film charts its own thematic course, paying tribute to the incisiveness of its literary source while simultaneously calling attention to its defects and limitations. Nurlan Bajtasov plays the eponymous student, unnamed but clearly intended to represent a prototypical middle-class Kazakh youth. Omirbayev follows this modern-day Raskolnikov from work (PA-ing out on a movie shoot) to school (attending lectures on capitalism, both Darwinist and neo-Marxist) to home (a small, dimly lit rented room), rendering all these environs in a hollowed-out series of Bressonian close-ups. This aesthetic strategy doesn’t seem particularly fruitful at first; after all, we already have a Bresson adaptation of Crime and Punishment in Pickpocket. It wasn’t until midway through the film that I started to understand Omirbayev’s project. When Dostoyevsky wrote his masterpiece, Kazakhstan was part of the Russian empire. Today’s Kazakhstan is an independent nation only twenty-two years old, having emerged from the fall of the Soviet Union without a clearly defined place in the world. The question that a Kazakh filmmaker must ask in adapting a classic of Russian literature such as Crime and Punishment is precisely the one that Omirbayev frames: how much of this really applies to me and my country? Read as a straight adaptation of its source, Student fails miserably. Where Dostoyevsky frames his novel’s central murder as a brutally intimate psychological spectacle, Omirbayev stages it behind a closed door, letting audio cues do the heavy lifting. At first glance, this seems like a total misreading: why excise the interiority of Dostoyevsky’s harrowing investigation into the act of murder in favor of a stale art-film convention? In fact, Omirbayev is asking a different set of questions, latching onto the existential desperation of the source text. Student’s central characters are not subjects in the same way that C&P’s are. Roughly the same age as the fledgling nation-state he calls home, the student has been thrust into a world of global capitalism in which he is granted no agency. Denied the power to act in any meaningful sense, the student lashes out in a senseless act of violence to assert the very fact of his existence. Meanwhile, the film’s equivalent of Dostoyevsky’s saintly Sonia is portrayed as mute, lacking the power even to speak. Neither character is presented in depth; Omirbayev suggests that the psychological multidimensionality of Dostoyevsky’s fiction is yet another trapping of the foreign Western order applied theoretically but denied in practice to the people of post-Soviet Kazakhstan (not an outlandish claim, considering who the nation’s most famous citizen is for many Americans). As critique, this approach works brilliantly, wrestling with cultural heritage in a tough-minded fashion that few films dare to adopt. As an aesthetic strategy, however, Omirbayev’s push-and-pull method of adaptation feels like something of a dead end, albeit a revealing one. Though Student demonstrates the ways Dostoyevsky (and Bresson) are complicit with an imperialistic political and economic philosophy, it doesn’t do much in the way of suggesting a better way to make art. The neat dialectic of Omirbayev’s approach is inherently hostile to things like character, depth of feeling, or aesthetic rapture – i.e., the stuff of narrative art, or as Omirbayev might have it, the myth thereof – making it pretty much impossible to move beyond the film’s sources. Does Omirbayev mean to suggest that art itself is an anachronism, a hollow appendage of bourgeoisie culture? Casting himself as a hack director of feel-good tripe within the film seems to be a nod in that direction. Yet the power of Dostoyevsky and Bresson still casts a spell over the world of Student. The film is haunted by the spirit of art itself, a ghostly presence that takes a tepid step forward at the film’s conclusion, when a Kazakh poet’s work is published posthumously, cueing the film’s only use of non-diegetic music. Try as he might to break away from his aesthetic interlocutors, Omirbayev remains tethered to them, unable to fully reject the concept of humanity that they helped shape. Art may be dead, but its echoes won’t let us forget that it helped make us who we are. Student opens at Anthology Film Archives this Friday, May 31st. Written by: Will Noah on May 30, 2013. Last revised by: Double Exposure, our reviewer, on June 11, 2013.